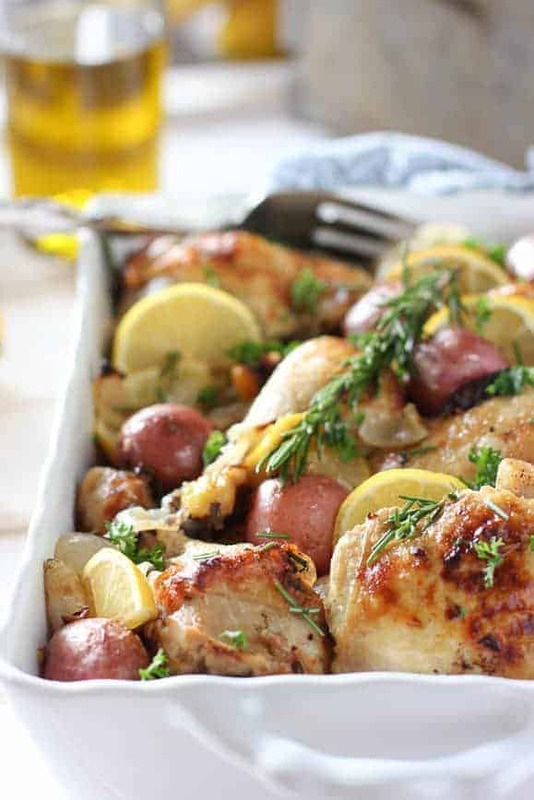 Roasted Lemon Chicken with Potatoes and Rosemary! – Once you make this easy dish, you will make it over and over again! Simple roasted chicken and potatoes never tasted so good! This is one of those recipes that can be made 100 different ways and they would all be good! If you never learned to cook another thing, you could fool your family for years with this same recipe, just by swapping out a few ingredients. Okay, maybe not years, but at least a month…or a week…I’m such a food drama queen. and this one has a ton of flavor! And as a bonus, it’s baked up in the same dish with the potatoes. One baking dish is all you need! 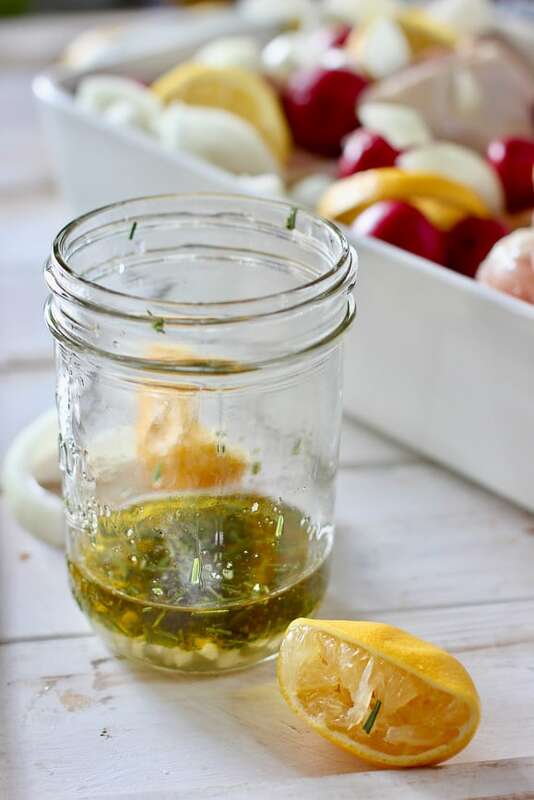 Start with this simple marinade. Olive oil, garlic, rosemary and lemon juice. How could something that is so simple taste so good! Pour the marinade right over the chicken and potatoes and in the oven it goes! No need to marinate for hours. After about 60 minutes, the chicken is roasted perfectly and the potatoes are tender. We like to serve this with a simple steamed veggie on the side like broccoli or these Smashed Brussels Sprouts. 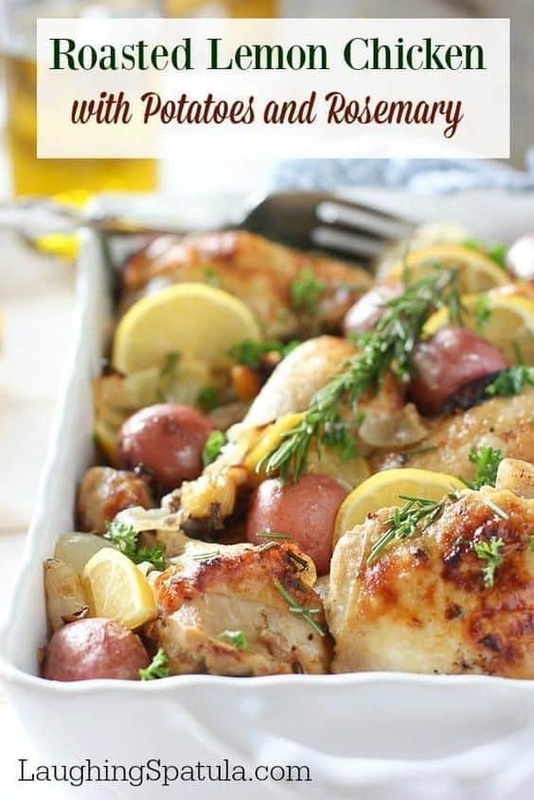 What else can I add to this Lemon Roasted Chicken and Potatoes recipe? Artichoke hearts – canned or marinated variety…make sure and drain before adding. Fresh red or green peppers – sliced and tossed in. carrots, turnips and the list goes on and on! Can I use boneless chicken breasts or chicken thighs? You best! Sub boneless chicken breasts or chicken thighs by cutting your potatoes in small one inch pieces and reducing the cook time to 30 minutes. Your chicken is done when it reaches 165 degrees. 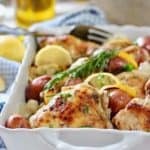 Can I make Lemon Rosemary Chicken in the Slow Cooker? Yes! 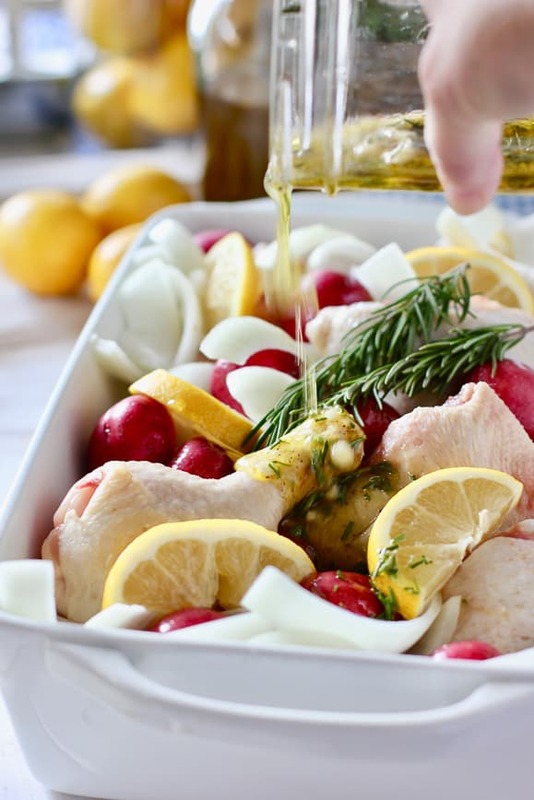 You can simply put the uncooked chicken and all the ingredients including potato right into your slow cooker OR sear the chicken for 3-4 minutes on each side to create additional flavor. I personally prefer to sear but it’s pretty tasty if you just dump and go. Need a quick visual? 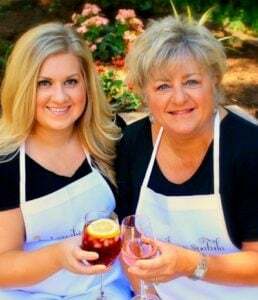 Check out our video on how to make this easy Roasted Lemon Chicken with Potatoes and Rosemary! Looking for more healthy and easy chicken recipes? You can find them all HERE! This recipe is Whole30 compliant and Paleo, if ‘your Paleo’ allows potoates (seems to be a controversial subject :). All my Favorite Whole30 Recipes in one spot! To Easy, Healthy Meals ….that don’t taste like it! Delicious recipe, both my husband and I loved it….. I’m a tough critic when it comes to food but this dish is worth adding it to my list of regulars. So no white potatoes on Paleo? You can have them on Whole30 so I assumed. Yikes! I better get my info straight before I hashtag Paleo! It’s my first go at this Paleo stuff and I have a lot to learn. Thanks for the note! 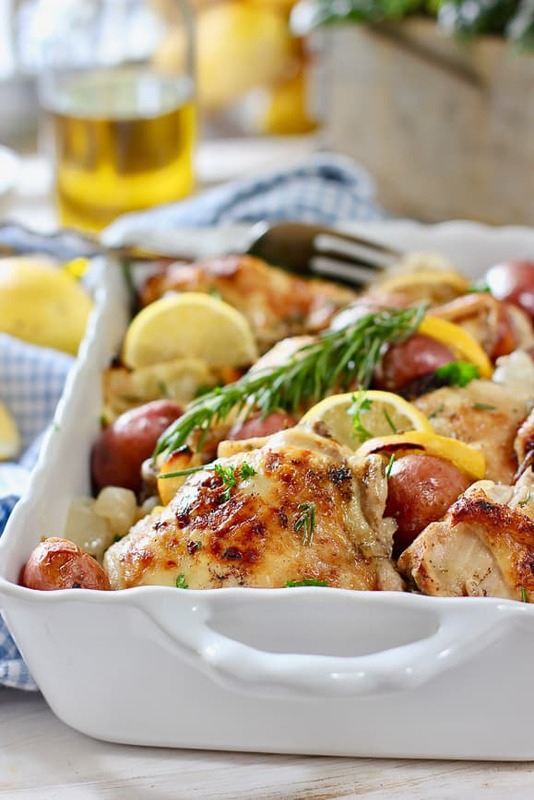 Google got me here searching for lemon rosemary chicken and potatoes….this one is a keeper. Used bone-in/skin-on thighs, Meyer lemons, some baby potatoes and peeled/chunked rainbow carrots and I dusted with steak seasoning before putting it into the oven. . Because I’m on Weight Watchers, I halved the oil (esp. with using the skin-on chicken), and it still came out divine. One of those perfect winter dinners!! I made for today’s dinner and it came out very good, thank you for this delicious recipe. Thanks Maria! I’m so glad you liked it and is it easy or what?? I so need to try this!! Look lovely.. I’m pinning straight away!!! Absolutely fabulous. I had to add about 15 minutes and everything was perfectly done. Flavor was incredible. Though the ingredients may be simple, I would whip this up for a dinner party without hesitation. Thanks for sharing! Five stars for sure (having trouble clicking them). Thank you Phaedra! These are my favorite kinda notes to get! (your not the only one having trouble clicking the stars on my recipes – I’ll take a look and see whats up!). Wow and wow that recipe was DELICIOUS! My husband wants to have this every week and it was so easy to make! THANK YOU! Hi Janelle – Thank you for the nice note and I’m so glad it worked out for you! It’s my go to recipe…so versatile too. I’m coming out with a citrus and herb version very soon so stand by! I make this all the time! It’s one of a my all time favorite dishes. I’ve added carrots to the mix and also have served with asparagus. . . Whichever way I’ve prepared it, it’s always been a hit! Carrots are a brilliant idea! I was going to make this again this weekend and try for a new twist…I think you just gave it to me. Chicken Pot Roast? Is that a thing?